“I have travelled far and wide on business and for pleasure — I can say without fear of contradiction that what we have created here today is unsurpassed anywhere,” Premier and Minister for Finance, Dr. the Hon. 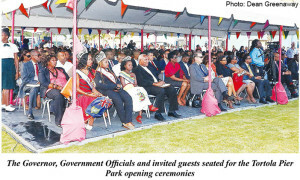 D. Orlando Smith declared at the opening of the Tortola Pier Park on Tuesday 16 February. Hon. Smith pointed out that the new facility is the Territory’s first opportunity to create a lasting impression to cruise passengers, some of which he said will be first time visitors. The Premier gave assurance that residents will have access to the park and that the facility is not only be for cruise tourists: “This Pier Park is also meant to be enjoyed equally by the residents of the BVI. Indeed it would be a travesty if we were to close down this beautiful park when the cruise ships have gone away for the evening,” he said. The Premier acknowledged the work that went into getting the Pier Park to this point and he applauded the Minister for sticking with the project: “I commend the Minister for Communications and Works, Hon. Mark Vanterpool, for delivering on this project. He has taken a lot of unnecessary licks for this one but he steadfastly kept his eye on the prize – the prize of today,” Hon. Smith added. He said the Pier Park was created to, not only welcome the soon-to-be approximately one million cruise ship passengers visiting the Territory on an annual basis, but to also facilitate our residents and other visitors to the islands. The Minister noted that the project has provided work for close to 250 persons, including 200 at the retail shops and another 50 or so at Tortola Pier Park, including service providers. Additionally, Hon. Vanterpool announced the Territory can expect to see an increase in the number of Cruise Ship passengers visiting the BVI. He also said that the 2016 forecast predicts an excess of 700,000 passengers. This number, he said is expected to climb to approximately one million over the next 24 months.